Sainsbury’s hit the headlines for all the wrong reasons in recent days. A poster designed for store staff which implies that they should convince shoppers to spend an extra 50p on their visits to the retailer was mistakenly made public when it was displayed in a branch window. Within hours the faux pas had transformed into a social media nightmare as it went ‘viral’ across Twitter as well as leading news websites. Rivals Lidl responded with a tweet containing a photo of their own 50p challenge, ‘to encourage every one of our lovely customers to save as many 50ps as possible. While the response from Lidl may seem jovial enough it does hint at the wider trend which YouGov has noted over the past year or so. Our mid-year BrandIndex Buzz Rankings showed budget supermarkets Aldi and Lidl in the top four, as consumers responded to their appeal of good quality products at affordable prices. Sainsbury’s came in at tenth. "I did think there was someone following me around the store whispering "buy more expensive wine" last time I went shopping #50pChallenge." 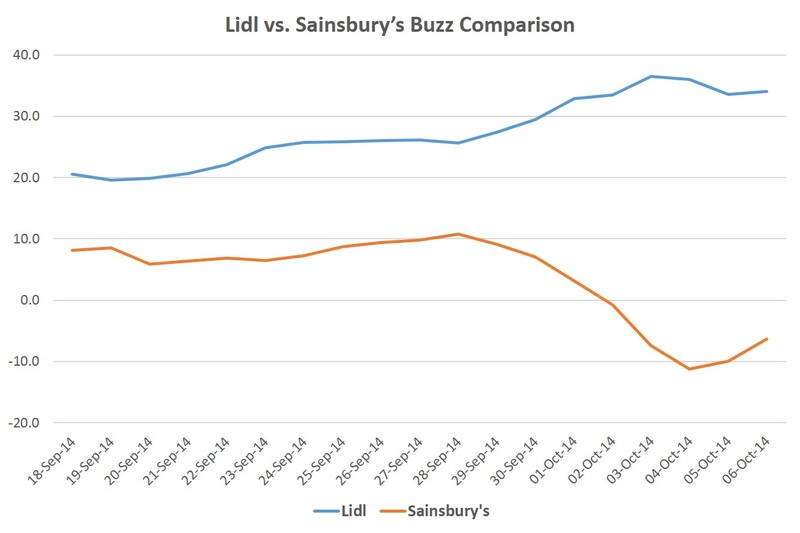 YouGov’s Buzz rankings (which assesses whether a respondent has heard anything negative or positive about a brand) shows the contrasting fortunes of Sainsbury’s and Lidl since the poster became public. We can see clear evidence of Sainsbury’s score decreasing while Lidl had a noticeable increase. Sainsbury’s saw their score decrease to a low of -11.2, a big decrease from +10.8 beforehand. While the 50p incident may appear trivial in the grand scheme of things, we can see that there can be an immediate impact on a brand and a knock-on effect for competitors. It must be noted that news stories such as this are likely to be forgotten very quickly. But with the grocery sector facing one of its most competitive periods to date including increasing competition from emerging brands, it is imperative for brands such as Sainsbury’s to understand the influence of such publicity and find innovative way to harness public positivity.